Early modern period-map of the island. A photo of Ada Kaleh. Ada Kaleh (Romanian pronunciation: [ˈada kaˈle] from Turkish: Adakale meaning "Island Fortress", Hungarian: Újorsova or Ada Kaleh, Serbian and Bulgarian: Адакале / Adakale) was a small island on the Danube in what is modern Romania, populated mostly by Turks of Romania, that was submerged during the construction of the Iron Gates hydroelectric plant in 1970. The island was about 3 km downstream from Orşova and was less than two kilometers long and approximately half a kilometer wide (1.75 x 0.4–0.5 km). The isle of Ada Kaleh is probably the most evocative victim of the Iron Gate dam's construction. Once an Ottoman Turkish exclave that changed hands multiple times in the 18th and 19th Centuries, it had a mosque and numerous twisting alleys, and was known as a free port and a smuggler's nest. The existence of Ada Kaleh was overlooked at the 1878 Congress of Berlin peace talks surrounding the Russo-Turkish War and the Romanian War of Independence, which allowed it to remain a de jure possession of the Ottoman Sultan until 1923. The Habsburg Monarchy built a Vauban-type fort there to defend it from the Ottoman Empire, and that fort would remain a bone of contention for the two empires. In 1699 the island came under Ottoman control, however, it was recaptured by the Austrians in the 1716–18 war, and the fortress of New Orșova was built by Austrian colonel Nicolas Doxat. After a four-month siege in 1738 it became Ottoman again, followed by the Austrians re-conquering it in 1789, but they had to return the island with the Treaty of Sistova (1791), which ended the 1787–91 war between the Ottoman Empire and the Habsburg Monarchy (and, by extension, the Ottoman–Habsburg wars). Thereafter, the island lost its military importance. In 1804, during the First Serbian Uprising, Serbian rebels, led by Milenko Stojković, caught and executed the Dahije (renegade Janissary junta in the Sanjak of Smederevo) that had fled Belgrade and taken refuge on the island, thereby ending Dahije tyranny. Even though the Ottomans lost the areas surrounding the island after the Russo-Turkish War (1877–1878) (and the Romanian War of Independence which was a part of the same conflict) the island was totally forgotten during the peace talks at the Congress of Berlin in 1878, which allowed it to remain a de jure Ottoman territory and the Ottoman sultan's private possession (although de facto, in 1913, Austria-Hungary unilaterally declared its sovereignty over the island) until the Treaty of Lausanne in 1923. 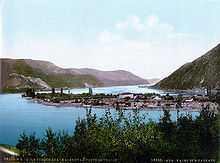 Between 1878 and 1918 the areas surrounding the island were controlled by Austria-Hungary to the north and Serbia to the south, but the island was under Ottoman sovereignty. The Ottoman Government continued to appoint and send a nahiye müdürü (administrative head of a unit smaller than a district and bigger than a village) and a kadı (judge) regularly. The island's inhabitants (officially citizens of the Ottoman Empire) enjoyed exemption from taxes and customs and were not subject to conscription. The islanders also had the right to vote during the Ottoman general elections of 1908. On May 12, 1913, taking advantage of the Balkan Wars, the island was occupied by the forces of Austria-Hungary. It thus became known as Újorsova in the Krassó-Szörény County. This was one of the last unilateral territorial expansions of Austria-Hungary before the outbreak of the First World War; the seizure was never officially recognized by the Ottoman government. Following the end of World War I, Romania unilaterally declared its sovereignty in 1919 and strengthened its claim with the Treaty of Trianon in 1920. On July 24, 1923, the new Republic of Turkey officially ceded Ada Kaleh to Romania with Articles 25 and 26 of the Treaty of Lausanne; by formally recognizing the related provisions in the Treaty of Trianon. The population lived primarily on the cultivation of tobacco and fishery, and later on tourism. In its last years of existence, the island's population ranged between 600 and 1,000 inhabitants. Before the island was covered by the waters of the Iron Gates dam, part of the population moved to Constanța in Romania and the rest to Turkey, invited by Prime Minister Demirel during his visit to the island. The Ada Kaleh Mosque, dating from 1903, was built on the site of an earlier Franciscan monastery. The carpet of the mosque, a gift from the Turkish Sultan Abdülhamid II, was relocated to the Constanţa Mosque in 1965. The island was visited by King Carol II of Romania in 1931, and by Prime Minister Süleyman Demirel of Turkey on September 13, 1967. During the construction of the dam, some of the structures that were built on the island were relocated to the nearby Şimian Island, including part of the masonry of the fortress' catacombs, the mosque, the bazaar, Mahmut Pasha's house, the graveyard and various other objects. However, the Ada Kaleh community decided to emigrate to Turkey after the evacuation of the island, instead of re-settling on Șimian Island. Also, a smaller part went to Dobruja, another Romanian territory with a Turkish minority, so the reconstruction of the "New Ada Kaleh" was never completed. Another view of the island, coloured photograph. Ada Kaleh plays an important part in the novel of one of the most famous Hungarian authors, Mór Jókai. In the novel The Golden Man (Az Arany Ember), published in 1872, Ada Kaleh is called the "No One's Isle" and it becomes an almost mythical symbol of peace, seclusion and beauty, juxtaposed with the material outside world. In Between the Woods and the Water, the second volume of Patrick Leigh Fermor's narrative of his journey across Europe, the author describes a delightful visit in 1934 with a group of elderly inhabitants and discusses the history of the island. (in Serbian) Ранко Јаковљевић. "Ada Kale". Rastko. ^ Jungmayer, Mihály: Ada-Kaleh. in: Zsebatlasz naptárral és statisztikai adatokkal. Szerk. : Kogutowitz, Károly Dr. és Hermann, Győző Dr. Magyar Földrajzi Intézet, Budapest, 1913. Wikimedia Commons has media related to Ada Kaleh.